In this article we will not be providing you with blue prints that contain dimensions and instructions on how to build your own photo booth enclosure. The reason is because we realize that building your photo booth will be a matter of personal taste and preferences. Instead we will give you an overview of what we consider to be the important factors to consider when building your own photo booth enclosure. The Look. The appearance of your photo booth is critical. The saying “First impressions formulate instant opinions” is very true. Make sure your photo booth looks nice and that it is not an eyesore. Make sure it has neutral colors that will easily blend in with the décor of any type of event. Avoid the embarrassment of a cheesy and cheap looking photo booth. The more professional and eye pleasing your photo booth looks the more positive reactions and future business you’ll receive. The way you decide to design your photo booth is a matter of personal taste, creativity and preferences. Always keep in mind that ultimately you are not building your photo booth for yourself but rather for others to enjoy. The safety. Do not ignore the importance of maintaining high safety standards. Make sure there are no electrical components accessible to the customers and that all cords and cables are tucked away and out of reach. Don’t skimp on durable construction of your photo booth enclosure. It needs to be capable of withstanding a great deal of abuse. Parties can often be filled with people who have been drinking and are not considering the damage they can inadvertently cause to the photo booth. Just know that your structure will be put to the test at some point by an over eager party guest. Examine your booth carefully for the weak points and eliminate the safety issues before going on your first event. Make sure your structure is solid, durable and non-flimsy. If you are using any kind of material to surround your enclosure be sure your photo booth is fire retardant. The comfort. Make sure your photo booth is comfortable to use for all your customers. The comfort factor is often determined by the size and interior design. Handicap Accessibility. Make sure your photo booth will be able to accommodate handicap customers. The cleanliness. When building the photo booth enclosure we recommend using materials that will be very easy to clean and sanitize. Cleaning doesn’t take long and should be done on a regular basis. The sign. 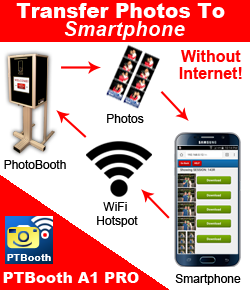 Make sure your photo booth enclosure has some kind of a sign that tells the customers what they are seeing. Usually the sign “PHOTO BOOTH” will do the job. There are no limits to improvements when it comes to Photo Booth Enclosures. In all honesty, since our original design, we have changed our photo booth enclosure design 5 times (1 change per year since starting our photo booth rental business). It really is a “learn as you go” journey. Be ready and expect that you will be making design changes along the way as well. Usually you cannot predict everything at the beginning and build everything right. We hope this article will help you to make better decisions when it comes to building your Photo Booth Enclosure.